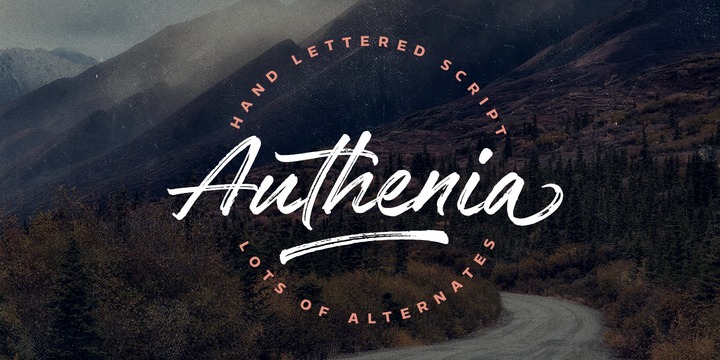 Authenia is written brush script published by Mika Melvas. It is available in a basic character set, alternate lower cases, an extended Latin characters, stylistic alternates & ligatures, underline. Letter are made with brush pen on paper, than scanned and drawn into vector format which offers an authentic, original look. It works great on both small & large sizes. This calligraphy, cursive font is ideal for logo, signature, wedding, branding and so on. Be authentic with Authenia! A font description published on Tuesday, March 7th, 2017 in Fonts, Mika Melvas, Mika Melvas by Alexandra that has 4,612 views.